Cut and Shoot, Texas, Montgomery County: naming, history, vintage photo, travel & more. Whenever the wondering starts about the origin or meaning of place names, we have two valuable sources to provide the desired information. One such source is Fred Tarpley's 1001 Texas Place Names, published by the University of Texas Press in 1980, and the New Handbook of Texas, published by the Texas State Historical Association in 1996 and also available with updates online at: http://www.tsha.utexas.edu/ And one of the first places about which most wonder is Cut And Shoot, located in eastern Montgomery County approximately forty miles north of Houston, near Conroe. Says oracle Tarpley, this community drew its name from an incident in which a preacher female members of the congregation. When members confronted the errant minister in church, some ran to their wagons to obtain knives and guns to...cut and shoot...either each other or the preacher. Tarpley also says that another version claims that the dispute was over the shape of a new steeple for the church. Robin Montgomery, writing for the New Handbook, confirms both stories as possible explanations, says that the incident occurred in 1912, and adds a land dispute between members of the congregation as a third possibility of cause. Montgomery also says that some believe that the name of their community was sparked when a small boy running from the melee was heard to say, "I�m going to cut around the corner and shoot through the bushes in a minute!" This last story reminds me of Judy's reaction to some of my other historical explanations. Says the skeptic, "Now is that true or is it history according to McDonald?" 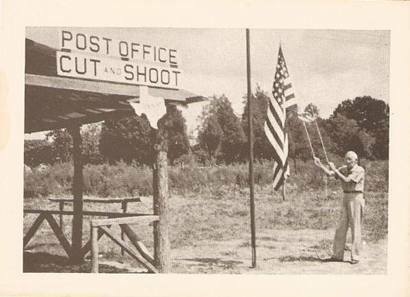 Likely few of us would have ever wondered about Cut And Shoot had it not been the home-town headquarters a half century past of a prominent boxer named Roy Harris. Harris' time near the top of his profession brought international attention to the small community. Cut And Shoot should not be confused with Cut, a farming community located south of Crockett in Houston County. Paso originally known as Enterprise. Wonder why they named them that?